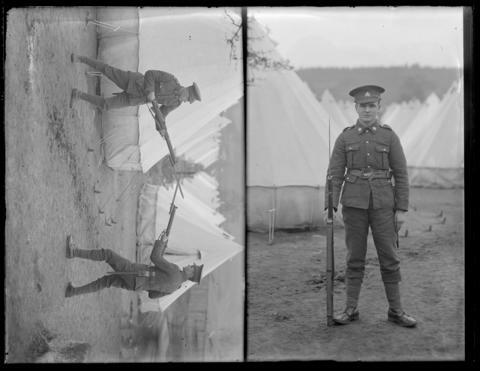 Photograph depicts two pictures of infantry soldiers from the Canadian Expeditionary Force (Siberia) at Willows Camp, Victoria, B.C. In the first picture, two soldiers mock-fight using their Lee-Enfield Rifles and attached bayonets. In the second picture, a young soldier wearing the British pattern 5-button Service Dress Jacket poses with his rifle. Restriction: image J-01881 is a glass plate negative. Researchers should consult the online reference image prior to consulting the original.